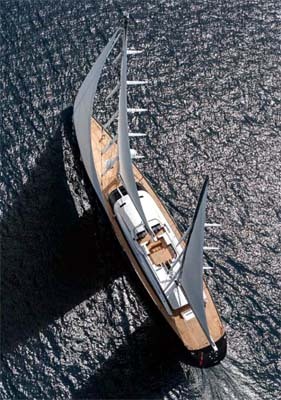 2010 144.9' (44.18m) Alloy Yachts "Imagine"
How does a group of small boat builders, who not long ago considered the building of a 40' sailboat a major undertaking, become one of the premier superyacht builders of sailing vessels in the world? 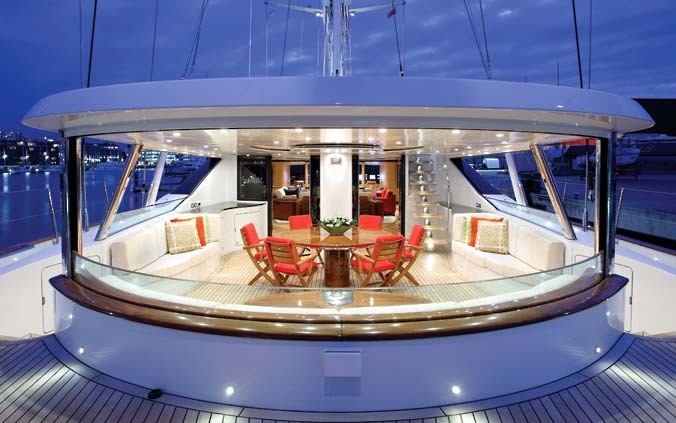 It is one of the most impressive stories in the yachting industry and I think you will be as intrigued as I am by the spectacular creations of Alloy Yachts. 2011 220' (67.2m) Alloy Yachts "Vertigo"
Over the last 25 years Alloy has emerged as one of the preeminent superyacht builders and it is due in large part to the vision of one man, Tony Hambrook. Hambrook was part of the original team of local boat builders in Henderson, New Zealand who, in the early 1980's, was commissioned to build a 28m aluminum yacht, which at the time was considered a very ambitious project. The demanding specifications of this build gave the builders a new level of skill and expertise and after completion of the vessel in 1985, the team of builders was inspired to continue their collaboration and Alloy Yachts was born. Many of the original builders are still key members of the Alloy team. Hambrook, who became the production manager early on, took the reins as managing director in 1990, the position he has held ever since. His focus is on unrelenting quality and control and has overseen the rapid expansion and technical innovations which have propelled this company on their meteoric rise. Hambrook’s philosophy has been to design and build as many components in-house as possible which has led to the implementation of many firsts in the superyacht sailing world. 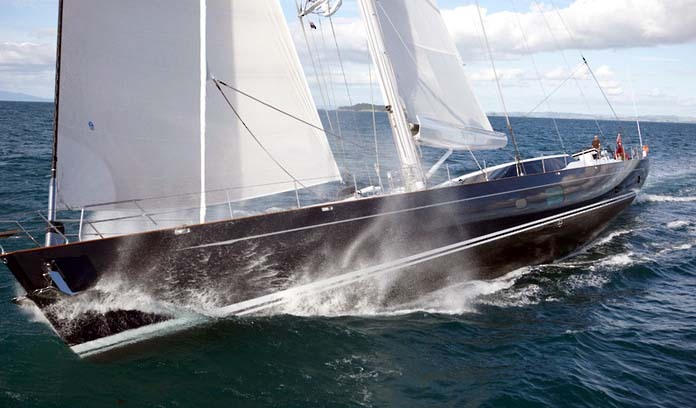 They were the first to use carbon fiber spars and fully battened mainsails, bringing the technology from the America's Cup to superyachts. They pioneered in-boom furling systems and developed a groundbreaking marine power management system allowing for power conversion and compatibility with any power source in the world. They even figured out how to put a heli-pad on one of their sailing designs. The list goes on and it is a big part of why Alloy has taken home more awards in the superyacht sailing categories than any other. The collaboration between the technical staff at Alloy and the yacht designers is a key factor in the success of these builds. 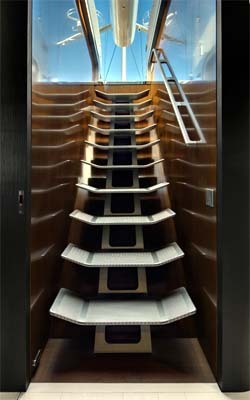 The attention to detail is unsurpassed in the yacht building world. Not only does Alloy design their own systems, they work with each client on the minute details and fabricate even little items like door hardware, latches, handrails, etc. They outsource only when it isn’t feasible to fabricate, which isn’t very often. The hull and exterior designs have been guided by several different design groups over the years. Phillipe Briand is responsible for their latest success with "Vertigo"; however Dubois has been by far the most prolific of Alloy's designers over the last 10 years. There have been a number of interior designers employed by the various owners which gives a touch of individuality to each build. Alloy has put a tremendous emphasis on technical innovation with their systems; however they have always built a sailing machine first. 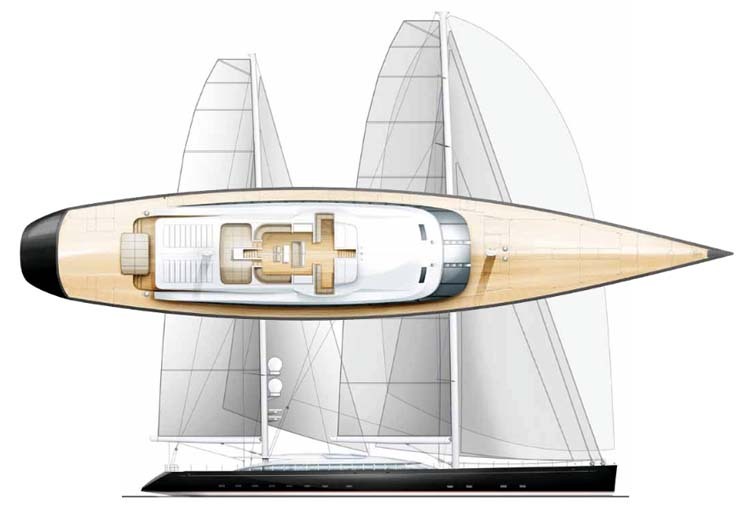 As with Perini Navi their design specs border on the Grand Prix racer category. While each design has its distinctive character, there are similarities in hull shapes. The prismatic coefficients show them to be fine forward with relatively low wetted surface for their LOA. As you would expect with the length of waterline on these designs the theoretical hull speed numbers are high, 16 to 19 knots. SA/Displacement though is where it gets really impressive. I looked at a range of the Alloy designs from 108’ to 220’ and found numbers from 22-29 which puts them way outside even the racer - cruiser category. 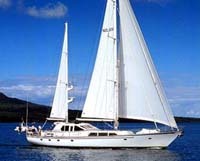 As with most modern designs which have a fine entry, they still have a fair amount of beam and it is carried well aft. It gives you good initial stability and lets you carry a lot of canvas and still not be sailing on your ear. The bonus as always is you get tremendous volume down below to the delight of your interior design firm. Esthetically, they are…….. gorgeous. Thoroughly modern with a hint of the traditional. Most of Dubois' recent designs show little rake or flare in the bow. 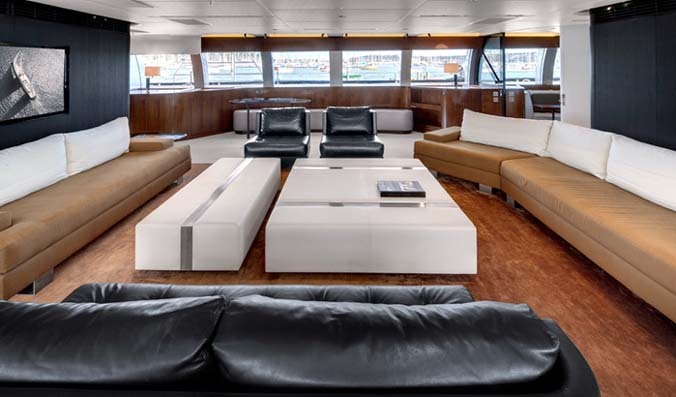 There is some spring in the sheer which leaves the yacht looking narrow at the hip and there is a bit of tumblehome amidships which softens the overall look. Having enough freeboard to keep you dry and at the same time not look slab-sided, is not a problem in this size range. With all the sophistication of these designs, they manage to have a very clean look on deck which leaves the exterior design with a quite elegant appearance. Since 1991 Alloy has built 40 yachts over 100' and currently has 4 in production. 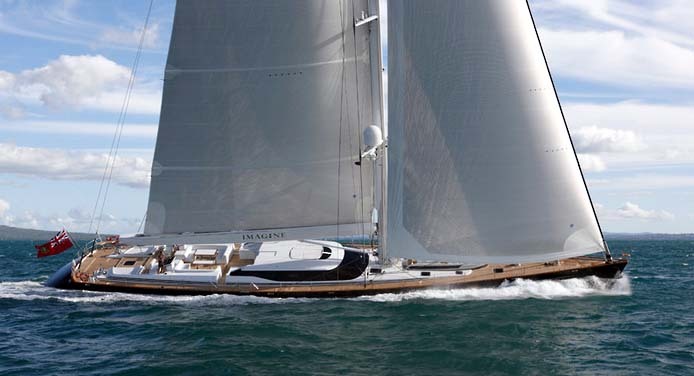 They have won best design awards on numerous yachts over the years and it is easy to see why their latest creation "Vertigo", a 220 foot staysail ketch, has racked up 19 awards this last year alone, including "Sailing Yacht of the Year" by Boat International World Superyacht Awards. Each new launch seems to bring another level of sophistication and more accolades. These are exciting times in the world of superyacht sail. Perini Navi helped bring large sail back to the forefront of world cruising yachts and Alloy Yachts seems intent on one-upping them. This is one arms race I can get behind! Brooke 102' Sailing Yacht "Pacific Eagle"
Originally built by Alloy Yachts and given a major refit in 2002, ketch rigged "Pacific Eagle" is currently in New Zealand and is in immaculate condition.